Analysis: Americans decide Tuesday whether to bring the MAGA bandwagon to a screeching stop. WASHINGTON — President Donald Trump is of two minds about Tuesday's midterm elections: They could be the end of the world — or they might not be that big a deal at all. As he's criss-crossed the country, barnstorming for Republican candidates and his own 2020 re-election prospects, Trump has told prospective voters that a Democratic takeover of the House would be followed by a breakdown of the economy, open borders, rampant crime, the destruction of Social Security and Medicare, and massive tax hikes. None of that is true — House Democrats won't be able to change any laws at all without the Senate and the president on board — and even Trump has long suggested that this election isn't as significant as the last one or the next one. That assessment has gotten a bit of an upgrade in the race's final days — though it is still far short of the shopworn political mantra that each impending election is "the most important" ever. "This is one of the most important elections of our lifetime," he said at a rally in Columbia, Missouri, Thursday night. But as voters stream to the polls Tuesday, following record numbers who already have availed themselves of early voting in many states, the rest of the political world, including Trump's team, sees this midterm test of his political standing as a potentially cataclysmic political moment. "When we say that this midterm is the most important midterm ever, that is not an overstatement," Rep. Stephanie Murphy, D-Fla., said. Voters "have a choice as to whether or not to vote for hope and a future of equality and living up to American values or they have the alternative choice of voting for fear and division and hate." At the very least, they will collectively decide whether to apply a foot to the gas or the brake of Trump's turbo-charged bandwagon. 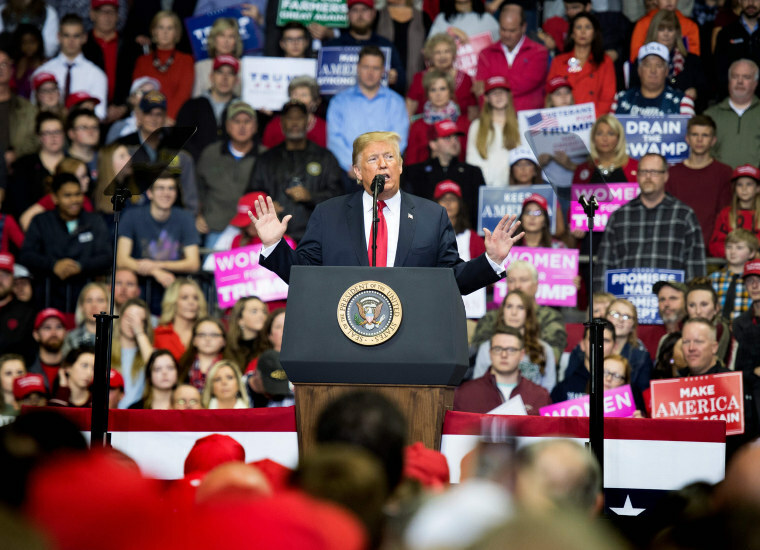 If Republicans keep control of the House and Senate, Trump will be emboldened to move forward with his policy agenda, which he has said includes new rounds of tax cuts, full funding for his border wall and new limits on legal immigration. And his party will be able to tailor debates in Congress to help his 2020 re-election campaign and divide his Democratic rivals. If Democrats win the House — they need to net a 23-seat gain to do that — they will have the power to kill his legislative agenda, investigate him and members of his administration, and use the floor to set up fights that they believe are advantageous to their hopes of recapturing the White House. If they win the House, "the smartest thing Democrats could do is break his base by actually trying to play ball on some different bipartisan issues, especially issues that his base won’t like," said a former Trump White House official. "To me, that would be the sharpest strategy.... The stupidest strategy would be to go all in on investigations and try to impeach him and be unwilling to find common ground." But, the former official added, "I think it’s going to be complete open warfare and Trump is at his best in complete open warfare." On Monday, the website FiveThirtyEight put Democrats' chances of winning control of the House at 87.5 percent — meaning that the site thinks there's a one-in-eight probability of Republicans holding onto their majority. Conversely, with most of the competitive Senate races on the map playing out in heavily Republican states, Republicans have a five-in-six chance of retaining power in that chamber. There was a time in American history when divided government produced big, bipartisan deal-making. But in recent decades, presidents have had difficulty negotiating with the House and Senate when they are controlled by the opposite party. President Barack Obama's signature laws — Obamacare and the Dodd-Frank overhaul of financial services regulations — were both enacted when Democrats controlled both chambers. In 2014, after four years of failing to make progress with Republicans in Congress, he rolled out a "pen" and "phone" strategy designed to use the powers of the executive office to make policy without the legislative branch. Trump has used both an accommodating Republican-controlled Congress and the authority of the executive branch to make policy. As Rep. Tom Cole, R-Okla., noted: "A Republican majority makes it a lot easier" for a Republican president to legislate. "If the House flips ... basically, the only things you can do are things you can compromise with a Democratic majority," he said. "And that’s going to be hard to do." Some have posited there might be some small room for negotiation between a president and a newly Democratic House. Both sides might have some vested interest in showing the American public that they can govern. Rep. Hakeem Jeffries, D-N.Y., said Democrats are willing to work with Trump on three items he's said he's interested in: lowering prescription drug prices, funding infrastructure projects and eliminating corruption in government. "On all three issue areas, the president has talked the talk," Jeffries said. "If Democrats are elected in the majority, we are going to try to work with him so that he walks the walk." Trump said Thursday that he'd have to "work a little bit differently" if he's dealing with a Democratic House. "It'll all work out, but I don't think that's going to happen." In a few hours, the next two years of his presidency will start to come into focus.